Lorraine O'Grady is a New York-based artist and critic, who works in conceptual art and performance art that integrates photo and video installation. Her work explores the cultural construction of black female identity. 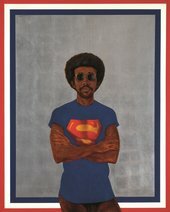 See O’Grady’s work Art Is…, 1983 in Soul of A Nation: Art in the Age of Black Power at Tate Modern (until 22 October 2017).